The power of animation meets the art of story-telling to create magic on-screen, known as: "The Adventures of Tintin: The Secret of the Unicorn". "How's your thirst for an adventure, Captain?" "Unquenchable, Tintin! "...with a perfect dialogue to end a near-perfect feature-length animation movie, this one tops as a complete package for the fans and followers of the popular comic franchise. Tintin just got bigger and better! Pacy, with perfect detailing, this movie never derails from the plot, whilst maintaining continuity in such a way that, even a novice movie-goer realizes the back-end effort that was put in order to achieve something spectacular. In recent times, this particular category of animation was actually not received well by the audience,(Monster House, to name) , but Steven Spielberg knew what he was doing and what was to be done to start a new franchise, particularly when a big one, had come to an end after ruling hearts, for over a decade. Every character was well crafted but I felt it was Snowy who ultimately comes out as the star performer in the movie-with funny scenes, he is rightfully shown as the smartest dog, with tactics which were amazing and equally digestible. 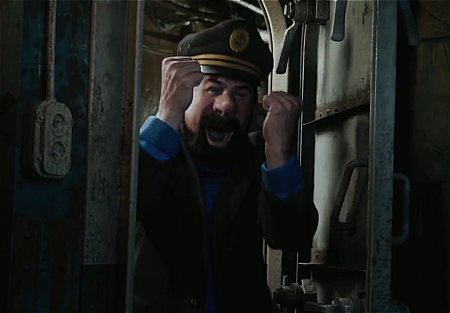 Tintin was fine, and Haddock sprinkled humor with command-as if, the movie never rested on a single character's shoulders! 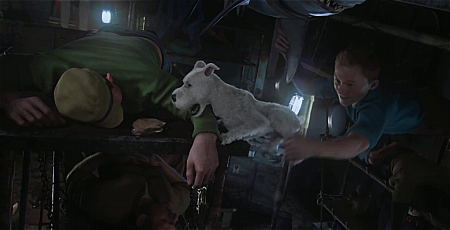 I would give anything to watch this Tintin and the vulture-chase sequence, n no. of times! Plot-wise: basically two stories-Red Rackham's Treasure and The Secret Of The Unicorn were merged in this movie, with the first half covering almost all the scenes from "The Secret Of..".There is the pick-pocket, the escape-sequences, Snowy,Thompson and Thompson of course. Second half was actually faster and had more in terms of action and story, with some unforgettable sequences. 3D-could have been better, but I understand that viewers would be more engrossed in the movie than just the effects-hence, the makers are forgiven for this. The score: I felt this is the only low-point of the movie-unlike other Spielberg movies, the background score was not majestic at all, rather at times, it was felt that the music toned down the excitement of the scenes. Finally, the direction: Just one word- Spielberg. There is a promise of a sequel(who wouldn't want that!) as well. In short, this is a movie worth your money and expectations. Made more for the fans and followers than the rest. If Kung Fu Panda 2 will be remembered for the innovation its animation possessed, then this movie will be known forever for the detailing and convincing capabilities in its animation,and also, for the way, a long running franchise(I expect, to say the least! ), should start. not much work done in 3D....u might get disappointed....rather, watch it in 2D.